Soak poha in water for 2 min and then drain water and set aside. Heat oil in a pan, add mustard seeds and cover the pan. When the seeds have popped, add urad dal and stir until lightly browned. Then add onions, chili, ginger, and stir until onions are lightly browned. Add potatoes, turmeric powder, ¼ cup water, salt, and stir well. Cook covered on medium heat until potatoes are well cooked. Continue heating uncovered, until all water has evaporated. 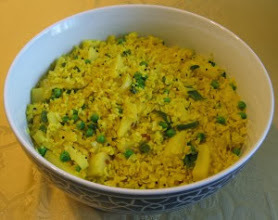 Add poha, peas, and stir well. Continue heating for 5 min. Add cilantro and stir well.